I’m on my way to interview Pamela D. Howe a local Tucson artist. As I drive through her neighborhood I am struck by the beauty and solitude of the desert that surrounds her home. She is waiting in her courtyard with her beloved dogs who greet me with gusto. Pamela whisks me into her breakfast nook and offers me some Constant Comment tea and we sit together sipping and looking out the windows at some amazing Sonoran scenery. I was thinking what a pleasant way to start an interview and I was sure this had to be a special place of inspiration. Pamela explained that indeed several of her paintings were a product of her meditation time in this very cozy spot. She loves observing the bobcats, jackrabbits, ravens and many other local animals. “Art reflects our experiences and understandings. I find myself drawn to natural rhythms, undercurrents” she says. Pamela is a truly diverse and interesting person which translates into her expressive art mediums. Her favorites are oil, watercolor, and three-dimensional multimedia. Wildlife is not the only subject she sets her sights on as she loves to find interesting landscape details, such as saguaro skeletons. Although she says she did not have formal training she signed up for art classes while getting her teaching degree and fit in courses at Carnegie Mellon and Pitt while teaching Language Arts for the Pittsburgh school district. She also found time for classes at the Art Institute of Tucson. 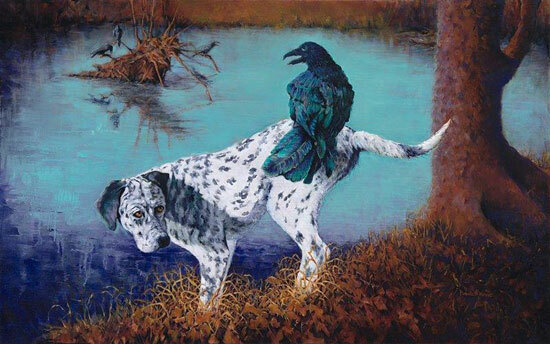 I asked Pamela what prompted her to start painting Ravens. She explained that during her years in Pennsylvania she and a friend would hike, camp and forage together. They would find old animal bones, crow’s claws and a multitude of organic and natural bits and pieces that would spark her imagination as to how animals are put together. When she moved to Arizona in 1980 with her dog Moon she became intrigued with the western wildlife. 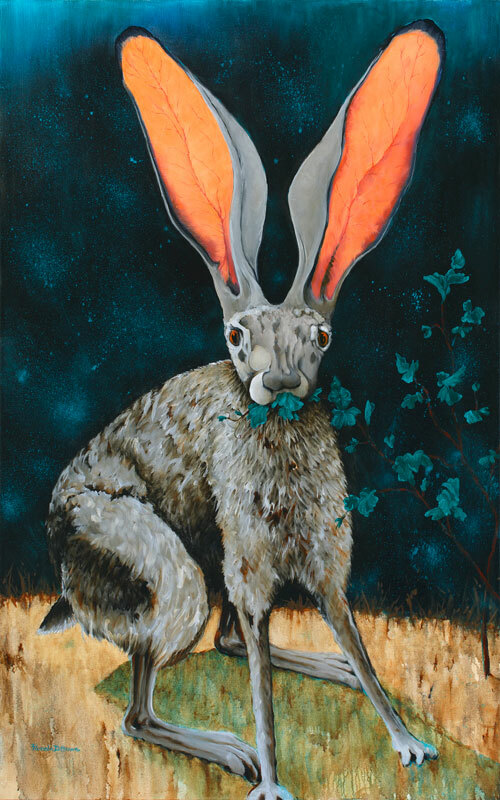 Pamela found herself adding an element of fantasy to her musings about the nature around her and creating stories that eventually found their expression on paper, canvas, and sculpture. 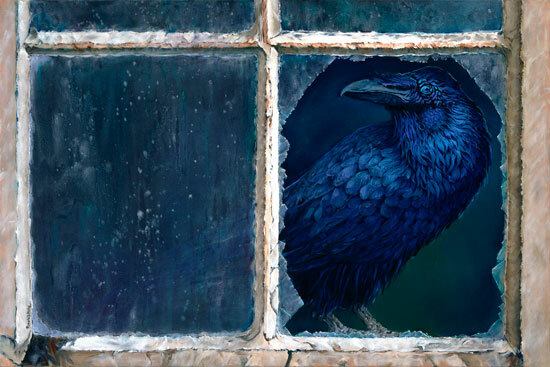 Not wanting her Ravens to seem sinister she would contemplate about the bird, asking herself “Is he curious, is he dreaming?” The more questions she came up with helped her to give him a personality. 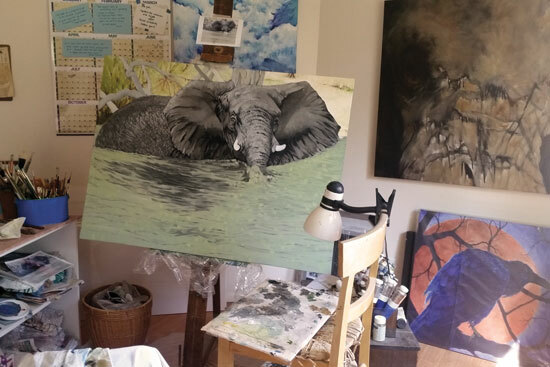 At this point, we migrated to Pamela’s home studio (she has a building south of town that houses her large multimedia studio) where I was pleased to see a painting of an elephant in progress. This was not an elephant she saw at a local zoo, it was a young African bull that swam past her and a group of friends as they were touring on a river boat. That moment in her words was “like Eden” and “the most awesome” part of the trip. Using her thoughtful approach to her developing character on canvas, Pamela wants to know “what’s happening in this scenario?” and “where did he come from and where is he going?” I will joyfully anticipate the opportunity to see the finished work! As we wrapped up our time together we found our way back to Pamela’s lovely nook and finished our tea. On the wall beside us was a small oil painting of a Native American man which she told me was her first work. I could readily see how much she had grown her art since that time, but her gift was visible even then. She explained that the portrait of that Native man did not look exactly like him, but was rendered just how she thought it should be. “You color what you see, we must project something onto what we see,” she says. For Pamela life has been a creative and intuitive journey. She has been a signature member of the Southern Arizona Watercolor Guild (25 years) and is currently a juried member of the Desert Artisans’ Gallery, Tucson. For many years she and a co-artist Jan Nell Bettes worked together to create Jamela multimedia sculpture. She is currently writing and illustrating a book “Moon and Raven” the adventures of an unusual friendship. We walked through the courtyard and as Pamela walked me to my truck, I wanted to know what was next. She laughed and said “Well this is my last hurrah! 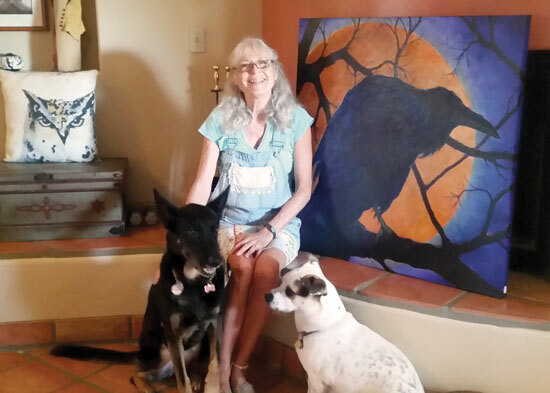 My last chapter and I want to keep the momentum going with my animal paintings!” I told her that I could see much more coming from her creative endeavors into the future. She laughed again and said “My husband and I call this our last resort!” referring to their beautiful desert home. I look forward to seeing more of Pamela’s charming, whimsical and sometimes moody creatures. 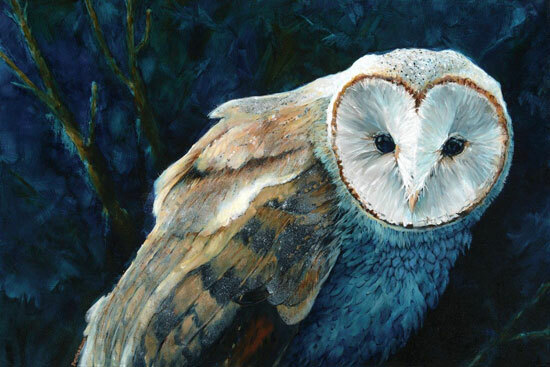 Pamela Howe’s work can be seen at Desert Artisans’ Gallery, Tucson, AZ. Alexandria Winslow is Advertising Director at Desert Artisans’ Gallery, Tucson, AZ and an accomplished acrylic painter.